There is just something about the daily ritual of coffee: the fragrant, homey smell, the comfort of that first sip, the legitimate excuse to pause during a busy day. My early memories of coffee are set in an old fashioned farmhouse with deep sinks, a stove lit from a box of matches kept close at hand, and rain sometimes falling on the old tin roof– Pa’s house. My great-grandparents and their six daughters ran a family farm during the Depression era, raising cotton and food for themselves and their livestock, and working extra odd jobs to make ends meet. Nothing about their life was easy, and they didn’t take anything for granted. But even in the hardest times, there was always coffee, made in a drip pot and poured into simple ceramic cups that came as “freebies” in boxes of oatmeal. No one had much in those days, but you could always count on a little spot of comfort from that tin pot that never left the stove except to be washed and re-filled. Each household was loyal to a particular brand and roast, but even when offered to a visitor with a differing opinion, it was never turned down. Whether consumed as the “best part of waking up” or enjoyed as a solitary moment of rest at the end of a hard day, the ritual of coffee was cherished. Country homes often seem to combine the useful and beautiful to create comforting staple items that serve multiple purposes. I love the idea of my great-grandmother’s pretty coffee cups coming as a bonus in her oatmeal – what a treat it must have been to collect them! As the child and grandchild of true “country folks”, there are many symbols of this resourcefulness that I cherish, and one especially dear is the calendar towel. Each year at Christmas time, the cotton gin sent local farmers their annual gift of a calendar towel, which was proudly displayed in a prominent spot. At the end of the year, the towel was repurposed to dry dishes and little hands, and became a soft, faded reminder of the passing of time. The new edition was hung in its place and the tradition married past and present in a useful, familiar way. 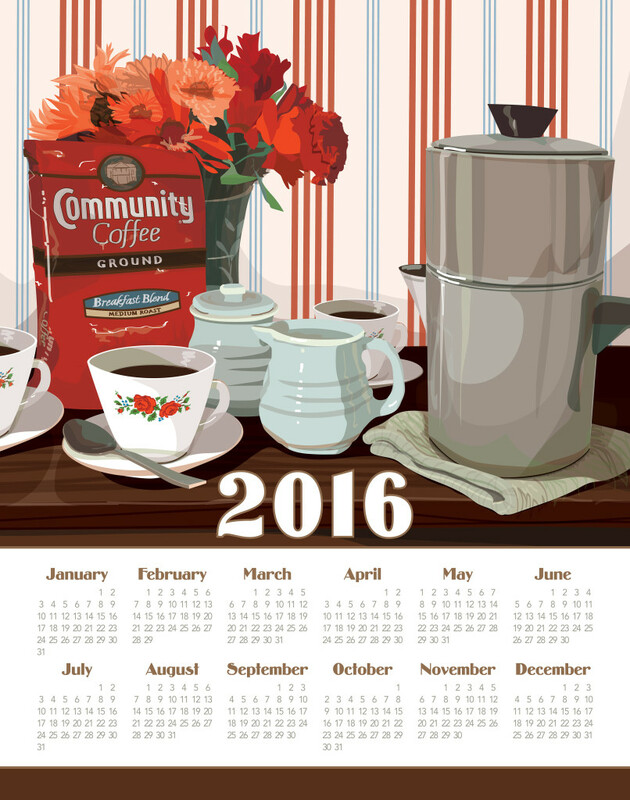 In its fourth year, the Richard Creative Calendar Towel honors the ritual of coffee and its perpetual relevance in our daily lives – whether made in the fanciest modern coffee maker or an old tin drip pot. I hope that you display your calendar towel in a place where you find joy and comfort in simple rituals with those you love.